I have known Trav and Sel Harper for a number of years now and I have photographed their 2001 VX Commodore once before for a private shoot. It was just after Trav had transformed the car to his tastes and he wanted some updated photos of the car. This time around, we met down in Albany, Western Australia, the day before the Motul Racewars event. I was holding my Cash Days 8th mile race there and Trav had entered his car in the same event. In a bold move, Trav decided to throw caution to the wind and drive the car to the shoot, right down the main drag of Albany! I don’t think the residents were quite prepared for the noise or the fumes that a methanol-burning LS makes. As we proceeded en route to the location, two fine police officers happened to catch a glimpse of the VX and they weren’t quite sure if the carbies hanging out of the bonnet were a standard fitment from the Holden factory. As they turned their car around to catch up to Trav, I decided that I needed some new socks, so I slowed my wagon to a crawl and proceeded to look for a parking spot, somewhat holding up the boys in blue on the single lane road, who very sadly, lost sight of Trav. It was a real shame. Well, as luck would have it, mid photo shoot, some much nicer police officers came down and suggested that Trav go and put the car on his trailer for the return trip. One run through the town was enough they reckoned. Good blokes. 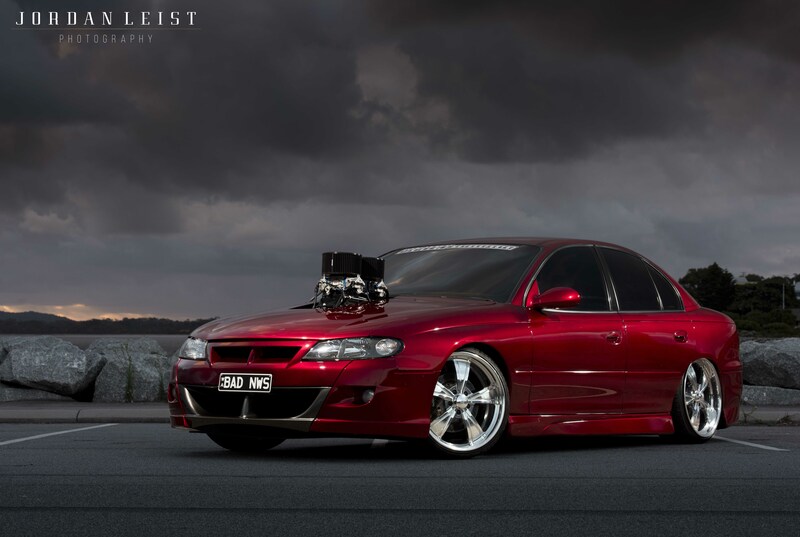 As for the car, it was in mid-2013 that Trav purchased the 2001 Holden VX commodore off a local bloke, Dan Brett, who had already extensively modified the car with a custom paint job, a 403ci stroker motor, big brakes and wheels. It was a good looking car even back then. Once he purchased the car, he vowed to leave it as-is and just enjoy it – that lasted a whole two months before it was getting repainted for a new look. That lasted until Motorvation 28 where it sustained a bit of damage. “It was that instance that had me contemplating a colour change so and I stripped the car back to a bare shell and started again. It was a bold move but it was now or never,” said Trav. It was Adam and Cara from Cronic Customs who did all the specialised fitting of parts, completed the fuel system and fabricated the exhaust. The final part was the wiring, which was left up to another good mate, Tom Scale.